Armoured adequatly and equipped with standard bows, the training of these men has been excellent, they are very prepared for war and have no qualms about shooting infantry down from afar, though they dislike being under fire themselves. 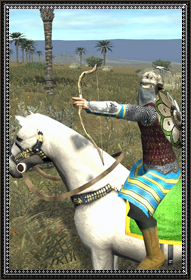 Well trained Horse Archers with strong armour and weaponry, they will rain death down from above. This bazaar expands the slave markets to accomodate more higher quantities of product. Slave Barracks allow the amir to train a dedicated corps of loyal warriors and enforce proper order on the settlement. The Royal Palace Guard is the ultimate symbol of the sultan's authority and the headquarters of his elite slave guards.